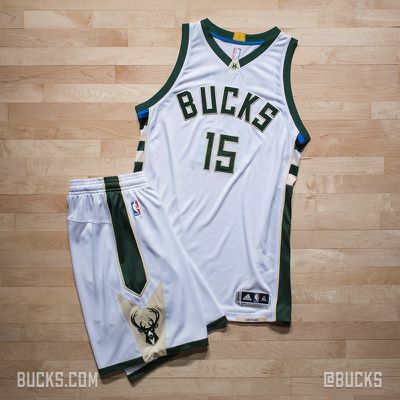 Could Sam Dekker or Frank Kaminsky be wearing these new uniforms after the NBA Draft? Editor's note: Of course, Bucky's 5th Quarter is your free home for Wisconsin Badgers coverage. At times, however, B5Q does also expand outside UW coverage -- including coverage of UW-Whitewater's success and our podcast, the Kielbasa Kings Sports Extravaganza. This is one of those instances. After unveiling their new logos nearly two months ago in April, the Milwaukee Bucks debuted their new road and home uniforms to the public Saturday during their inaugural Summer Block Party in Milwaukee. On the grounds of Schlitz Park, team ownership, along with current and former players unveiled the new-look jerseys the Bucks will wear starting next season. Our SB Nation cousins at BrewHoop.com, as usual, covered this event in fine fashion. 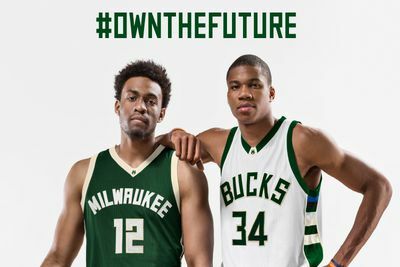 Be sure to check out them out for more Milwaukee Bucks news and notes going forward. The Milwaukee Bucks unveiled their new home and road uniforms this afternoon at the team's inaugural Summer Block Party event on the grounds of Schlitz Park. The jersey unveiling continues an updated visual identity for the franchise that began in April when the team presented a new color palette and three unique logos that capture the rich heritage of the franchise while ushering in an exciting new era of Bucks basketball. Members of the current Bucks roster and franchise greats were on hand as fans joined together to enjoy local musical acts, food, drink and Bucks chatter at the tipoff to the summer festival season, but the attention turned to the future during a special ceremony in which the new uniforms were revealed. Bucks All-Stars Bobby Dandridge and Vin Baker joined Head Coach Jason Kidd and current players Giannis Antetokounmpo, John Henson, Damien Inglis and Jabari Parker to span the timeline from the team's championship history to its future. The new Bucks uniforms are designed around a modern form that incorporates classic elements and proudly reflects the values of our community. White remains the base color on the new home uniforms with lettering and numbers presented in Good Land Green outlined in Cream City Cream. Good Land Green is the base color of the new road uniforms with lettering and numbers presented in white outlined in Cream City Cream. Great Lakes Blue is featured as an accent color on both uniforms. "Our new uniforms will serve as a showcase of our franchise's proud heritage and bright future on the NBA's global stage," Bucks Vice President of Strategy and Operations Alex Lasry said. "The new look is a perfect representation of the city and state we call home - honoring our blue-collar community values in a modern design that speaks to the exciting future for the team and region." BLUE COLLAR - The inside of the collar features a blue stripe, representative of the blue collar work ethic of not only the Bucks, but also of the city and state that the team proudly represents. M CREST - Detailing on the outside of the collar features the modern "M" that is present in both the primary and secondary logos. 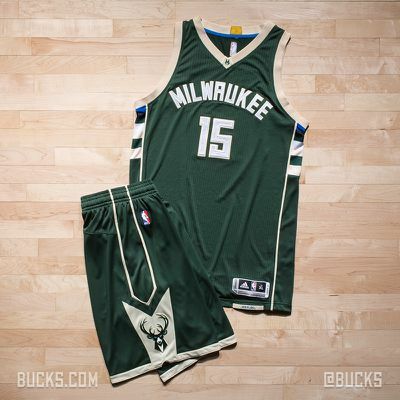 CHAMPIONSHIP TAB - The gold tab on the jerseys commemorates the Bucks' 1971 World Championship season. Milwaukee is one of only 16 teams to wear the gold championship tab. CREAM CITY RAINBOW - The unique color block pattern on the sides of the jerseys showcases the color palette of the new Bucks and is an homage to the popular "Irish Rainbow" detailing that adorned Bucks uniforms from 1977 through 1993. MILWAUKEE ROADS - For the first time since 1977, the Bucks' official road uniforms will proudly display "Milwaukee" across the chest, returning the city to its rightful place on the global stage. FEAR THE DEER - A custom "Fear the Deer" player tag at the bottom of the jerseys serves as a reminder to the players each time they put on their uniforms of the aggressive attitude and team spirit they are expected to carry with them onto the court. NEGATIVE SPACE M - Detailing on the sides of the shorts is designed to create an "M" in the negative space, another subtle carryover from our team marks and a representation of our hometown pride. CUSTOM FONT - Word marks and numerals are created from the Bucks new proprietary font that is featured throughout the new logo set. 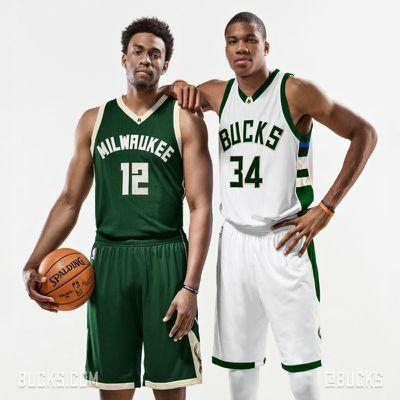 What do you think of the new Milwaukee Bucks uniforms? Nope, don't like the look. I'll take 1,000 of them if Sam Dekker or Frank Kaminsky is drafted by the Bucks. C'mon, man! This is a Badgers news site only. They look kind of blah to me if the old style bucks rainbow went down to the pants I think I would warm up to them better. Also block numbers would be better just my opinion. I like em! Reminds me of the earlier 80s Don Nelson led, perinenal 50 win team's colors. Fear The Deer!! or for us married men; Fear The Dear.